Shanghai, sixth city of the World! Shanghai, the New York of the West! While Shanghai evokes mixed images of glamour, exoticism, Sino-western hybridity, the Bund has become its metonymic name par excellence. The Bund ranks first in any introduction to the city in contemporary guides as THE place to go to discover the wonders of Shanghai and its now sanitized and non controversial past. Current accounts usually point to the bizarre architectural heritage that the municipal government lately, but definitely has chosen to turn into a tourist attraction for domestic and foreign consumption alike. Although the Bund fell into complete obscurity – literally – after 1949, it returned to life with brightly illuminated façades in the late 1980s and, more recently, with expensive and chic coffee-terraces on top of its ‘old’ buildings. The present essay aims to tell a different story and to unveil a much more complex and multi-layered history. It relies on a large body of materials, especially visual sources, to document the transformation of an undistinguished space – a riverfront – into a central place of political, social and architectural contest. Our exploration starts from the earliest visual records of the place by Western or Chinese residents and travelers and move into the late 1940s. While brief references will be made to the revolutionary and post-revolutionary period, this essay focuses on the late Qing and Republican period. In terms of geographical coverage, our focus will be on the « conventional » Bund, namely the section of the riverfront that extended southward from Soochow Creek (Suzhouhe) to the border with the French Concession.4 For photographs, however, we had to identify and glean them from a variety of sources, mostly books published before 1949. Paintings may be considered as a questionable source for the historian, at least when taken as an “actual” source about reality in the past. Our approach, however, has been to test the limits of these – on the surface – imaginary renderings of the Bund. Of course, there was no reason to question the intent of the painters, most of them anonymous artists, to give a fair view of the riverfront. Yet, as for drawings and paintings by military painters, there is a significant margin for imagination, beautification, and other involuntary or voluntary modifications. Arguably, the stakes in landscape are much less salient than when it comes to come up with a visual report on a battle and other heroic moments. There is less risk of a major deformation. The artists, however, could have simplified the view, or skipped an ugly building or ”improved” it with a more decent appearance. While we had access only to the reproductions published in Arts of Asia, the quality was high enough, especially after digitizing, to allow for close-up examination of individual buildings. The third source we mobilized for this study is maps. They were useful in several ways. First, because maps sometimes display specific buildings, we were able to ascertain the existence of buildings at a certain point in time, even if the accuracy of commercial maps is sometimes questionable. Second, maps provided the exact location of the buildings represented in our images. The general views of the Bund we used – both paintings and photographs – hardly showed any details about the space between the buildings, even when there was an empty yard. The streets are either not represented or hidden from view both in paintings and photographs. Perspective also introduced a deformation in assessing which building was where, or simply to make sure a building was indeed on the Bund (and not in the background). To overcome this problem, we reconstituted the cadastral lots on maps and traced their transformation over time.10 Another problem in the written records is that buildings are usually referred to by the name of their occupant rather than by the structure itself. Conversely, some companies remained on the same spot, but rebuilt their premises two to three times. Finally, some companies moved their offices to different locations on the Bund. In other words, one can be led to believe there is a new building where there is only a change of owner or tenant. To avoid seeing a new building where there was only a new tenant, we had to trace the occupancy of the buildings. The second case – reconstruction of premises – was of course easier to solve through the visual record, while the “intra-Bund” moves were indeed limited. The history of Shanghai has been told many times as a “success story” entirely due to Western presence. Without the least hesitation, a 1934 guide of Shanghai boldly stated that “less than a century ago, Shanghai was little more than an anchorage for junks, with a few villages scattered along the low, muddy banks of the river.”60 Of course, by the 1930s, the Bund had developed into a complex and sophisticated area where work easily overlapped with leisure. “The handsome boulevard is flanked by a park space which extends to the river-edge with its unobstrusive landing stages, where tenders bring passengers from great ocean liners.”62 Nevertheless, if Shanghai came to be represented in a way that magnified its aspect and symbolized Chinese modernity, the way in which Westerners and Chinese perceived and described the city, especially the Bund, differs widely. Whereas the Bund figures prominently in all Western renditions of Shanghai, Chinese writers were far less sensitive to its assumed grandeur and glamour. The Western bias, however, was a late development. The first travelers to Shanghai were impressed by the Chinese Bund – obviously the only developed place before Westerners settled in Shanghai – and failed to harbor the prejudices of those who followed their tracks some years later. The first visitors to Shanghai, Lindsay and Gutzlaff, reached the city in 1832. While they spent most of their time trying to obtain the right to trade in Shanghai, they did not fail to note the brisk trade that was taking place in the harbor. Lindsay reported quite favorably on the local facilities: “Commodious wharfs and large warehouses occupy the banks of the river, which is deep enough to allow junks to come and unload alongside of them; in the middle it has from six to eight fathoms, and is nearly half a mile in breadth”.64 These fairly positive visions of the city and its original Bund, along the walled city, would slowly give way to derogatory comments or simply complete omission with the rise of the English Bund. This line of discourse was usually continued and magnified in the following decades. In the first Western guide of Shanghai in 1904, the Bund comes first on the list of “Routes with chief objects of interest”. It is described as “one of the most interesting, famous, and handsome thoroughfares in the world”, with the Shanghai Municipal Council as the valiant designer and protector of public interest that “fought against all attempts of the shipping interest to construct wharves for shipping” and made it “the great lung and promenade of Shanghai”.77 The Bund is also a place that extols the apparent cosmopolitan nature of Shanghai. There is movement, there are people from all over the world, they all go along the same street. The testimony of Wang Tao has remained an unchallenged view of early-treaty port Shanghai in Western and Chinese literature.93 Quite interestingly, it is not unlike the mythical and romanticized view of the later Bund we have inherited from the 1920s-1930s. What this parallel between the record by Wang Tao and visual sources suggests, apart from the issue of a distorted memory, is that the confrontation of textual records, from which historians elaborated their interpretation both of the appearance of mid-nineteenth century Shanghai and the reaction of a young Chinese literati to this scene, calls for a second and more cautious reading of these textual records. While the paintings by themselves would be a questionable source, their systematic study through time and confrontation with early photographic records actually provides a solid basis for a “visual reconstruction” of the early Bund and an alternative tool through which to reassess the textual record. The first image of the Bund Wang Tao recalls actually does not seem to have made a lasting impression on him. At least, it failed to attract him for a visit or casual stroll. In the diary he kept at various times between 1858 and 1860, Wang Tao usually mentions the various places he went to with his friends or by himself. The Bund is mentioned only once, after he had taken a trip to Hongkou, across Soochow Creek.95 In fact, one has to observe that in Chinese textual sources, the “Bund” failed to become the icon that figures so prominently in Western writing about the city. Although the waitan (Bund) was absent from city guides, it eventually came to be associated to Shanghai as a synonym for the city’s name. The waitan epitomized Shanghai, not necessarily physically, but rather for its lifestyle, attractions and dangers. A 1942 guide, Da shanghai, devotes two short sections to “tan”. One section “Huangpu tan” presents the Bund as the “point of origin” of the International Settlement, but immediately proceeds to describe it as the “Wall Street” of the city, with a high concentration of banks from all over the world. No other aspect of the Bund is mentioned, safe for the impressive architecture of these financial establishments. The other sections of the riverfront are glossed over. In another section the author explains to the traveler the meaning of “Shanghai tan” as the metaphor for the city as a whole, a place of pleasure for the rich, a fine example of a modern city of the 20th century, but also of traps and disillusions.99 Quite clearly, the visual record left a very different imprint about the Bund on people’s mind than written sources. There is a striking difference, however, between the Western and Chinese visions in the twentieth century. While the former wrote about it as an ode to their accomplishments in Shanghai, the latter used it to convey a sense of urban modernity. The status of Shanghai, as one of the principal entrepots between Europe and China, was mirrored by the architectural development of its waterfront. From its initial period as a meager outpost of mercantile enterprise the Bund quickly became the main stage for showcasing the city’s growing stature as a nexus of trade and finance. By tracing the growth of its physical form we gain some insight as to how Shanghai saw itself and wanted to be seen by the outside world. The Bund in the International Settlement went through three successive waves of renewal. Of course, the erection of new buildings did not take place at the same time during these periods of transformation. Yet on most locations buildings were torn down and resurrected two to three times. In this section we shall examine the architectural renewal that took place on the bund over a century. This study includes three visual narratives that attempt to take the reader along the Bund at three different periods. From the 1850s to the early 1870s, the Bund was lined with one- or two-story buildings [“A stroll along the Bund in the nineteenth century” (Narrative ID42)]. While they may have looked impressive to the newcomer, as Wang Tao recalled it, the buildings distinguished themselves more by the architecture than by the actual height. Chinese temples or guild halls in the walled city were far more impressive. The first generation of buildings was made up of constructions that often combined both offices and living quarters. Some companies were able to acquire a large track of the riverfront where, like and Dent, Beal & Co. or Russell & Co., they established a large compound made up of several constructions. Later, these compounds were parceled out and gave way to new individual structures. The second wave of construction was spread over a few decades starting from the 1880s to around W.W.I [“The Shanghai Bund at the Turn of the Century” (Narrative ID44)]. There was a double transformation. On the one hand many original lots were subdivided and opened up space for entirely new buildings. On the other hand, many existing edifices underwent their first transformation from their original neo-classic style to an equally pompous though more massive appearance. The third and last wave of construction – the one that gave the Shanghai Bund its present allure – took place over a single decade between 1920 and 1929, even if a few more additions were made in the 1930s [“The Billion Dollar Skyline: Shanghai\'s Bund in 1937” (Narrative ID36)]. The following table lists all the buildings that sprang from ground during these two fateful decades. This spate of construction is a direct reflection of the formidable growth and urge for modernization that engulfed the city before the Sino-Japanese war. From a structural perspective commercial compounds, as well as most other buildings along the Bund in the late nineteenth century, adopted what was known as a “compradoric” style of architecture. By no means based on sanctified principles of design, this description drew its name from the world of trade and the intermediary figure of the comprador. A comprador was a local resident, or someone fluent in the regional language, hired to facilitate trade and translate between European factors and local merchants. Shanghai’s first European-style buildings were built with local labor from European designs and directed by a Chinese foreman, thus giving rise to the name. Assembled by local Chinese builders according to plans or specifications either imported or drawn up on the scene by the Western firms, the buildings utilized local materials and building techniques. These structures often had verandahs, tile roofs and were generally one or two stories in height.111 While a more technical assessment of the buildings’ architecture might be British Colonial, the term compradoric does recognize the vital role played by local labor in actualizing the Bund’s first buildings. 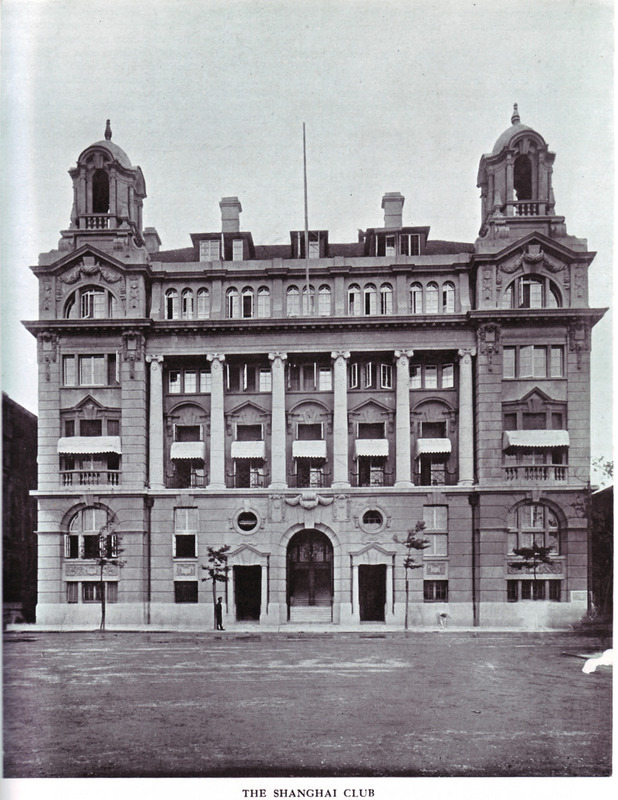 While Charles Dyce, a thirty-year resident of Shanghai, lamented in his memoirs that “the community was almost entirely commercial … [all] were there to supply in one form or another the wants of trade” not every building on the Bund was given over to the financing of, or trading in, tea, silk, and opium.115 The Shanghai Club’s first building, located on the southern end of the Bund on land purchased from the Shanghai Recreation Fund, is a good example of Shanghai’s early architecture (1864). The building’s symmetry, pediment, and columns all provide a link with Classical styles while the arcade, porches and decorative simplicity are indicative of its colonial situation. This did not mean, however, that it was sparsely furnished. 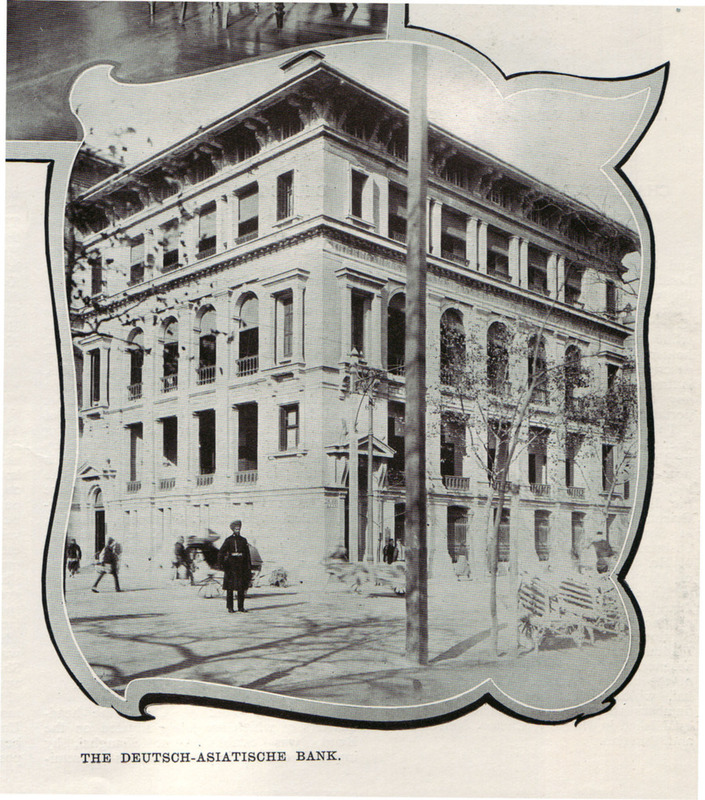 In his 1904 guide to the city, Charles Darwent wrote the Shanghai Club had “all the appointments of a first-class club – two large dining rooms and private ones, two billiard rooms, card-rooms, library of 16,364 books, an oyster bar, reading-room, kitchen on the top storey … There are twelve residential rooms.”117 Complementing this growth were Shanghai’s own nascent industrial facilities that could now supply some of the materials that earlier had to be imported. Even some of the firms that had their beginnings in mercantile activities began to take advantage of the property boom by speculating in land and property, sometimes with great financial success. The transformations of the Shanghai skyline caused by these developments are readily visible in the photographic record. Maybon’s 1873 photograph of the Bund reveals a well-developed settlement with almost a dozen ships anchored in the river but with still the appearance of a quiet harbor with few major structures on the riverfront. The French Bund, located south of the International Settlement, presents a few large buildings, while even further distant the low white hong of the Chinese merchants are visible along the city wall (See map). This generation of buildings populating the turn-of-the-century Bund fell into several categories: remainders of the compradoric/British Colonial style, Renaissance Revival, and a variety of other Revival styles. The remaining Colonial buildings were the legacy of the nineteenth century’s successive renovation and remodeling of earlier structures. 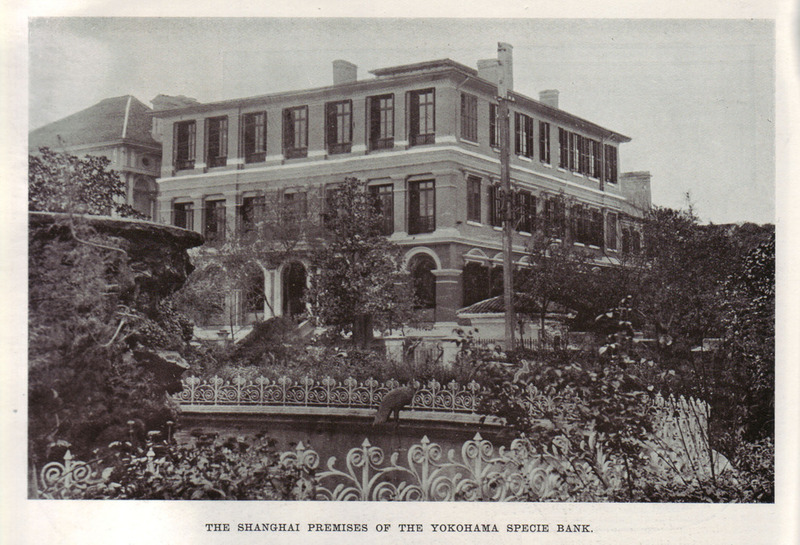 A good example of this is the old Pustau & Co. building that by 1907 was occupied by the Yokohama Specie Bank, a transformation indicative of the overall move from trade to finance. 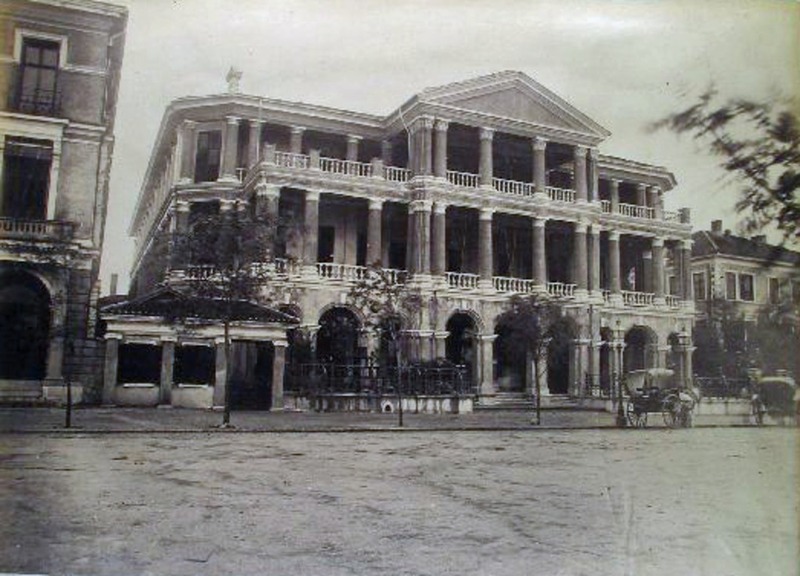 The structure, built in 1865, is clearly two-storey in a 1876 panorama of the northern bund. It is difficult to tell if the louvered shutters of the second floor fronted a porch or a series of rooms, but by 1907 the growing pressure on real estate necessitated the occupation of every available inch. 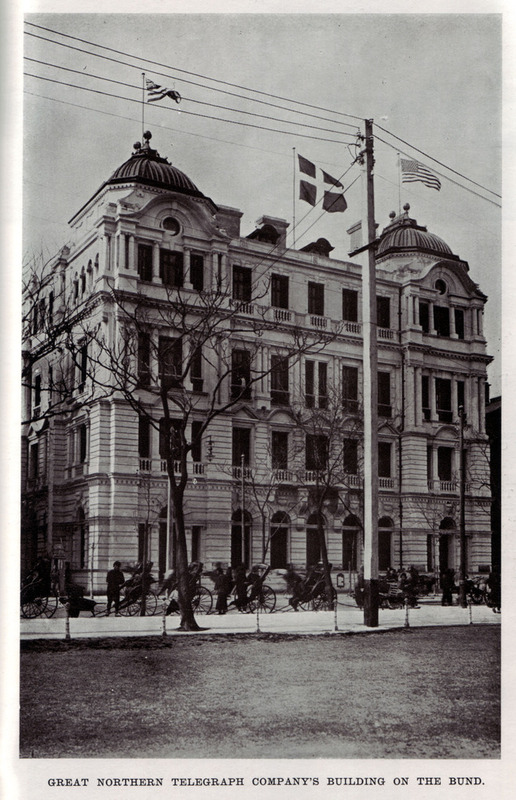 In order to solve this dilemma, the earlier two-storey structure, with its arched ground floor, simply received a third floor continuing the fenestration and design of the second level (See the Yokohama Specie Bank building). 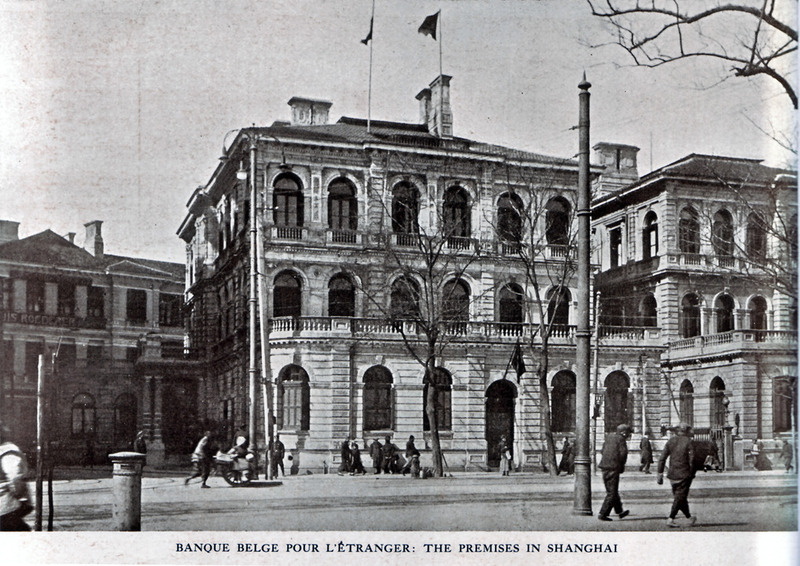 The Colonial style with its verandahs and gardens was no longer appropriate for Shanghai’s larger and larger companies who increasingly turned to new technologies and styles to build their “public face” on the Bund. Renaissance revival was one of the most popular styles for turn-of-the-century construction along the Bund. Some examples along include the Deutsch-Asiatische Bank, the Banque Belge pour l'Etranger, and the Great Northern Telegraph Company. Neo-Renaissance architecture drew from a wide variety of influences, but its origins in fifteenth and sixteenth-century Italian and later French buildings provide a clear palette of basic forms. These motifs included rusticated masonry, especially on the ground floor, quoins anchoring the building’s corners, symmetrical facades, arched windows, and pilasters. These elements all contributed to the recreation of earlier European structural forms. Some buildings also minimized the windows of the uppermost floor in order to recall the mezzanine floor of original Renaissance buildings. More formal in their appearance, Renaissance revival was widely used by banks. Given the prevalence of banks and other financial institutions on the Bund by the first decade of the twentieth century, it is not surprising to see the adoption of neo-Renaissance design in the second generation of Shanghai’s buildings. Finally, the Bund was also home to a few buildings that stood out as individual examples of less-popular Revival architecture or as unique unto themselves. 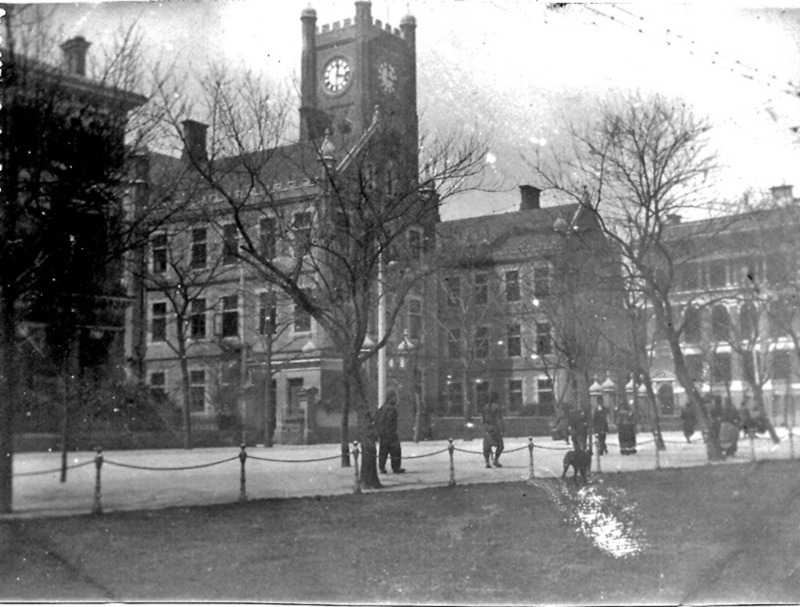 From 1892, the new Customs House lorded over the Bund with its 110-foot bell tower. The Tudor Revival influence on Shanghai’s second Customs House is visible in its fenestration and layout. Built out of red brick with white Ningbo stone facings with a red French tile roof, the guidebook, “All About Shanghai” referred to the Customs House as “one of the finest structures in Shanghai, its lofty clock tower a striking feature of the Bund skyline.”121 Launches from the Custom Shed’s pier also shuttled passengers the twelve miles to ocean liners on the Yangtze.123 While being careful to reserve pride of place for his own countrymen, Darwent commented in his 1904 guide to the city that “this club must be accorded the next place to the Shanghai Club in importance, as the headquarters of the influential German community in Shanghai.”125 At this point in Shanghai’s history, there was no attempt to introduce a hybridized, if still deeply imperial, form of architecture, like the Indo-Saracenic style that later found expression in Lutyen’s designs for New Delhi. Of course, the International Settlement was not a unitary entity but rather a complex mix of dozens of nations with competing economic and national interests, but the lack of any “Shanghainese” architecture, at least at this period, is certainly notable. The Bank of China building, the last major construction project on the Bund before the Communist takeover, perhaps stands as the best representative of a fusion of styles and motifs between European and Chinese principles of design. While there were no complete structures on the Bund that adopted Chinese styles in their exterior, the Bank of China building perhaps comes the closest to using indigenous architectural features. The green-glazed tile roof and decorative motifs on the structure’s façade are certainly influenced by local traditions. Although built by a European company, Palmer and Turner, one of the leading architects on the project, Lu Qianshou, was Chinese. Chronologically the last building to go up on the Bund, the Bank of China is The Bank of China stands as one of the only spaces on the Bund exhibiting an external combination of Chinese and European design in a modern building. The glamorous Bund – a glamour that overshadowed a more complex reality as seen before – started to shatter after the takeover by the Communist armies in May 1949. The Bund fell into oblivion in revolutionary Shanghai. Even if Chinese travelers coming to the city would certainly make the walk to the Bund and have their picture taken, such opportunities became rare with the enforcement of a rigid system of control on the movement of population. Apart from cadres and some technicians (which Shanghai had plenty and actually “exported” to other provinces), few people were allowed to travel. Trade no longer brought the flow of merchants that had made Shanghai famous. The workforce came to be recruited almost exclusively locally, with very few exceptions, after the mid-1950s. Foreign visitors were limited to technicians from the socialist bloc and only very occasional delegations from Western countries set foot in China. Tourism, both domestic and international just dried up. 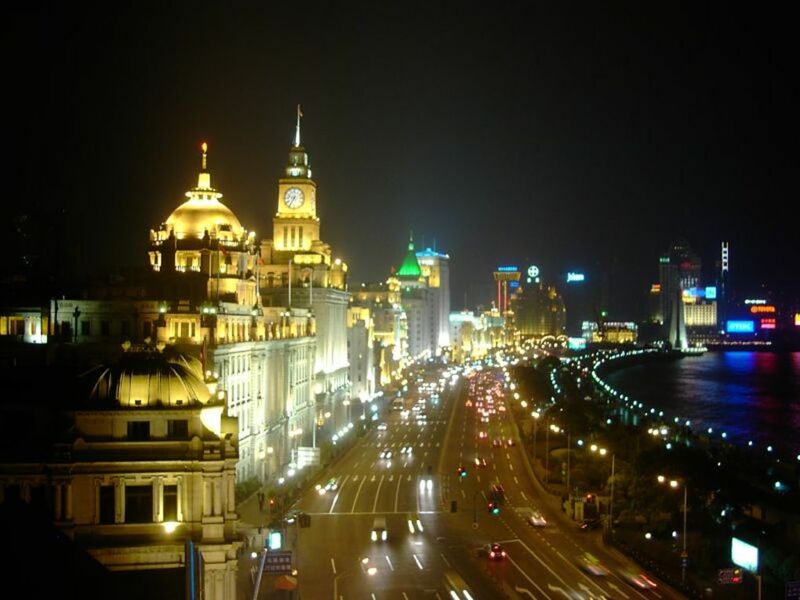 Little was done to maintain or enhance the buildings along the Bund or even to the Bund itself until the early 1990s. After the takeover of the city, the municipal government mostly reorganized the wharves and jetties, removing some of them to the south, tearing down scattered constructions to make way for green space.143 The dam that runs along the Huangpu was elevated from 5.8 to 6.9 meters. For a while, the municipal government fiddled with the idea of transforming the riverfront quite radically. There was a project of building an elevated highway over the original Bund. It would have connected with the massive bridge built next to the Garden Bridge and at the feet of the former British consulate. Fortunately, the project was abandoned, even if the Bund was enlarged and turned into a ten-lane highway (all trees were cut down in the process). A parking accommodating 200-300 vehicles was installed inside the newly built dam. The planned renovation of the Bund was completed in September 1992. Other additions were rather cosmetic, like the erection of a statue to commemorate the heroes of the revolution in Shanghai in the middle of the Bund garden (which again lost a large part of its green tracks to concrete) and one in honor of the first mayor of Shanghai, Chen Yi, in front of Nanjing lu. 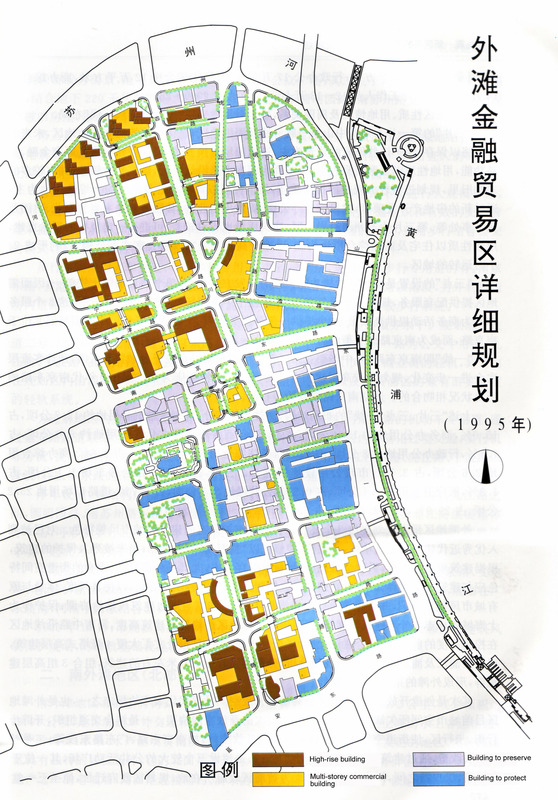 The new scheme included a detailed classification of all the buildings in the area defined in 1984. All the buildings along the Bund were retained either as “to be protected” (baohu jianzhu 保護建築) or “to be safeguarded” (baoliu jianzhu 保留建築). In fact, these categories crossed historical lines as both historical (namely pre-1949) and more buildings could be found in both categories. They could be rehabilitated, but their original appearance had to be preserved. Behind the first fronting blocks, most buildings fell under the category of multi-story or high-story buildings (whatever that meant) and could either be torn down and rebuilt or remodeled to fit present-day requirements for business (See map).147 Yet, what the plan defined as the “northern part” of the Southern Bund was actually the southern section of the former French Bund. The plans of the municipality seem to have left out the stretch of riverfront between Yan’an donglu (ex. Edward VII Ave) and Xinkaihe lu (ex. Place du Chateau d’eau) that formed the French Bund (Quai de France). The apparent rationale behind these choices may be one of history. On the one hand, the “British Bund” formed a remarkable row of historical buildings that link Shanghai to its colonial past. On the other hand, the selected section of the French Bund is associated to Shiliupu (十六鋪), the historical riverfront of the former walled city. Both sections have a relationship with a past that had to be balanced. In the 1990s and 2000s, as in the 1930s, the focus remained firmly centered on the “British Bund”. While its buildings are a legacy from Shanghai’s colonial past – something that was definitely erased during the first three decades of the regime – they are now being viewed in a different perspective by the city’s leaders. The city has invested in a somptuous illumination sheme to highlight the buildings on the Bund and emphasize Shanghai’s glamour. The buildings have been voided of their historical content or substance. The colonial past has been pushed back into the fold of history and only the thin surface of its heritage, reinterpreted for both domestic and international consumption, is being promoted. The Bund has become a “heritage” in a quasi UNESCO definition, a set of historical monuments worth preserving for their own sake, but not for what they represent historically. Worth preserving for what they convey in the current search of Shanghai for a new identity, or a renewed identity as the city reconnects with the world. That process is not unique to Shanghai. China has been in the grip of a “nostalgia” for the “old” – actually a real industry. But beyond the commercial aspects, this phenomenon reflects the need of the population and its leaders to reevaluate and reinvent the past in the context of the post-Deng reforms. In Shanghai, this reevaluation was nurtured by a reconstruction of the collective memory of the colonial past.149 Any search on the Internet generates hundreds of links and thousands of photographs. Many times, one encounters serious approximations about the history of the Bund (one guide even states the Bund has been in existence for hundreds of years), superficial references to its glamorous past (most often by Westerners), etc. Yet, it is clear that the Bund/外滩 has become fully part of Shanghai’s memory and claim for glamour on the worldwide stage. 3 By convention, throughout this text, we shall use the original names for places in English for the pre-1949 period. We refer to these places in post-1950 Shanghai by their Chinese names in pinyin transliteration. Whenever necessary, we add the current Chinese name in brackets. 4 Politzer, Eric, "The Changing Face of the Shanghai Bund, circa 1849-1879", Arts of Asia, 35, 2, 2005, pp. 64-81. 5 In one case – the 1898-1900 photograph – we did the reconstitution ourselves from three individual shots. 6 Sources of the photographs: Maybon, Ch.-B. ; Fredet, Jean, Histoire de la Concession française de Changhai [Bund in 1873 & 1876-1878] Paris, Plon, 1929; Politzer, “The changing face of the Bund” [Bund in 1876]; Wright, Arnold, Twentieth century impressions of Hongkong, Shanghai, and other treaty ports of China: their history, people, commerce, industries, and resources [Bund in 1907-1908], Lloyds Greater Britain Publishing Company, 1908; Shimazu, Chōjirō 島津長次郎, Shanhai annai [Bund in 1893 & ca.1913], 上海案内 Shanghai, Kinpūsha, 1918; Shanhai Kyoryūmindan sanjūgoshūnen kinenshi 上海居留民団三十五周年記念志 [Bund in 1894 & 1937-1938], Shanghai, Shanhai Kyoryūmindan, 1942; Kobori, Rintarō 小堀倫太郎, Natsukashi no Shanhai: shashinshū 懐かしの上海 : 写真集 [Bund in 1916-1918], Tokyo, Kokusho Kankōkai1984; Virtual Shanghai, “General view of the Bund and Huangpu River from Pudong”[Bund in 1898-1901]. 8 There were three photographs that came with estimated periods or no indication at all: one from Wright, Twentieth century impressions [no indication, book published in 1908]; Shimazu, Shanhai annai [“present view” of the Bund, book published in 1918]; Natsukashi no Shanhai [no date given]. The ‘internal critique’ of these documents led to the following dating: respectively 1907-09; 1910-12; 1914. For a discussion of the dating method, see individual photographs in the Virtual Shanghai image database. 9 The major maps we used [see “Source maps” on the Virtual Shanghai platform] are: “Ground plan of the Foreign Settlement at Shanghai - North of the Yang Kang Pang Canal”, from a survey by Mr. F.B.Youel R.N., 1855; “Plan of the English Settlement at Shanghae”, Shanghai, Shanghai Municipal Council, 1864-1866; “Street plan of the English, French and American settlement”, London, published for the North China Herald and North China Daily New Offices, Shanghai, ca 1870; “Plan de la concession française à Shanghai”, Shanghai, Imprimerie de Erhard, 1882; “Cadastral plan of the (so-called) English settlement, Shanghai”, Shanghai, Shanghai Municipal Council, 1890; “Street plan of the British and French Settlements”, Shanghai, 1900; Saishin Shanhai chizu 最新上海地図 (The New Map of Shanghai City), Shanghai, Shōsuido Shōten, 1908; Street Plan of the Foreign Settlement (Central District) & French Settlement at Shanghai in The Chronicle and directory for China, Corea, Japan, the Philippines, [Indo-china, Straits settlements, Siam, Borneo, Malay states, etc., Hong Kong, "Daily Press" Office, 1895 & 1926; Saishin Shanhai chizu 最新上海地圖 (The New map of Shanghai), Osaka, Mainichi shinbunsha; Shanghai shi hanghao lutu lu 上海市行號路圖錄 (Shanghai Street Directory), Shanghai, The Free Trading Co. Ltd., 2 vols., 1939-1940. 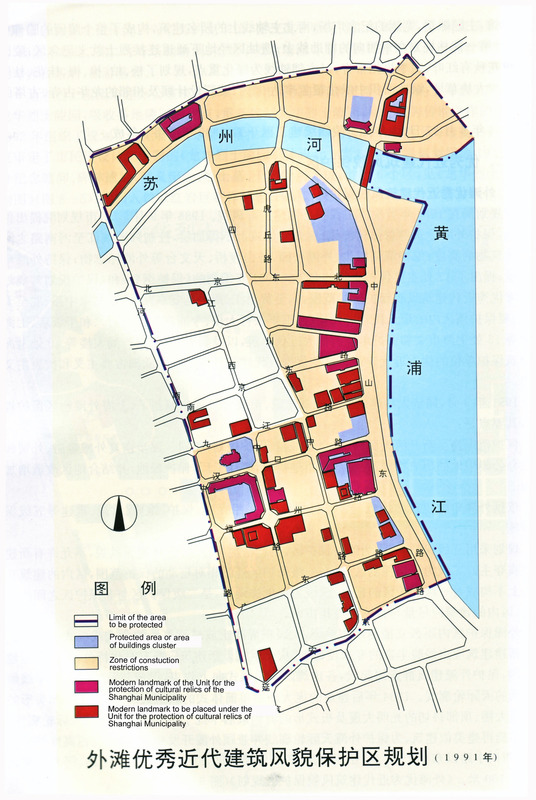 11 For 1987, we used a remarkable cartographic document produced by the Shanghai municipality. It covers the whole municipality at the block level. Shanghai shi shangyong dituce 上海市商用地图册 (Shanghai business atlas), Shanghai, Shanghai fanyi chuban gongsi, 1987, 2 vols. 13 Taylor, Jeremy E., "The Bund: littoral space of empire in the treaty ports of East Asia", Social History, Vol. 27, No. 2, 2002, p. 129. The argument is debatable. One can also read this linguistic process of appropriating foreign words as a form of spontaneous hybridization and practical way of working out a practical common language. The term ‘bund’, at least in Chinese, never had an impact on the native language. 14 « Ground plan of the Foreign Settlement at Shanghai - North of the Yang Kang Pang Canal, » from a survey by Mr. F.B.Youel R.N., 1855. 15 « Plan of the English Settlement at Shanghae ». 16 « Street plan of the English, French and American settlement, » London, published for the North China Herald and North China Daily New Offices, Shanghai, ca 1870. 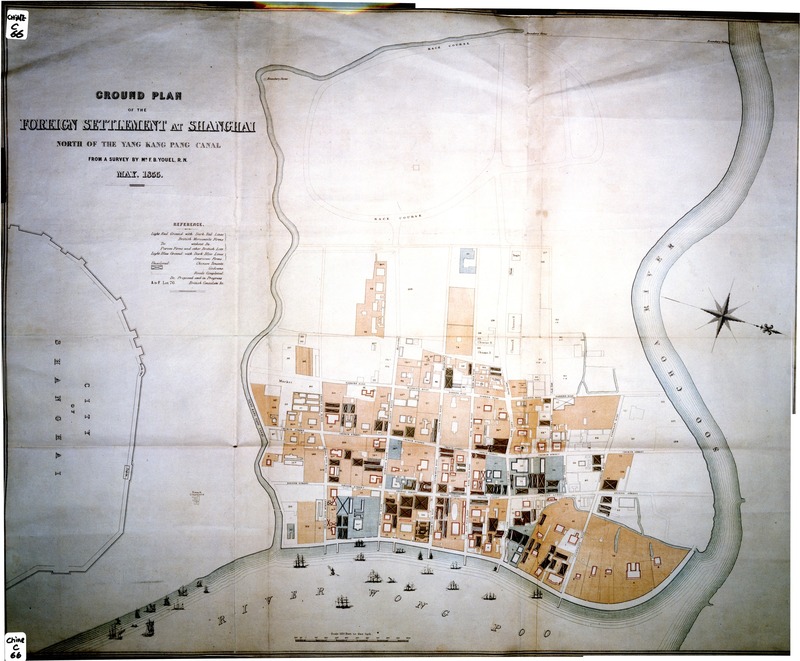 17 « Cadastral plan of the (so-called) English settlement, Shanghai », Shanghai, Shanghai Municipal Council, 1890. 19 « A map of the foreign settlements at Shanghai », Shanghai, 1900. 20 We have chosen to translate tan by bank. The actual meaning is closer to “beach”, which it actually was until the Bund was turned into an embankment by plating wooden posts along the bank. Up to then, at low ebb, the river withdrew and left a 30-meter wide open mud-bank. 21 Xue Liyong 薛理勇, Waitan de lishi he jianzhu 外滩的历史和建筑 (History and construction of the Bund), Shanghai, Shanghai shehui kexueyuan chubanshe 2002, p. 2. In several cases, the Chinese used the terms li 裡 (internal) and wai 外 (external) to indicate the greater (nei) or lesser (wai) degree of proximity of a location. There was even an intermediate degree with the use of zhong 中 (middle) for places located between these two extremes. There remains several place names in Shanghai that are linked to this practice. The Chinese name of the Garden Bridge – waibaidu qiao 外白渡橋 – is such a case. The name makes sense only in relation with another bridge called libaidu qiao 裡白渡橋 that was located further inside the Soochow Creek, whereas the Garden Bridge was located at the mouth of the creek where it merges into the Huangpu river. 24 On the history of street names in the French Concession, see the very careful study by J.H. Haan, The Sino-Western Miscellany, being historical notes about foreign life in China, s.l., s.n., 1993. 35 “Customs House”, photograph, undated, 2003.R22 Box 35, Getty Research Institute. In its early stage, the Bund probably looked like the Bund at Jiujiang for which J. Thomson left a good photographic record. J. Thomson, Illustrations of China and its People. A series of two hundred photographs, with letterpress descriptive of the places and people represented, London, Sampson Low, Marston, Low, and Searle, Vol. 3, 1874. 38 The photographic record documents the gradual process that turned the Bund from a small road into a wide area encompassing a road, a space covered with grass and trees, and jetties and pontoons. The earlier 30-meter long jetties were progressively turned into pathways on the newly reclaimed land. 42 Maybon & Fredet, Histoire de la Concession française de Changhai, 1929, p. 239 and p. 244. When solicited by the French consul, the Shanghai Daotai replied that while he fully understood the needs of the French merchants, he also observed that the areas coveted by the French consul were highly valued by the local Chinese merchants and that the price of land was expected to be much higher than the one previously acquired. Furthermore, he pointed that the owners of some buildings, such as the Tianhougong, would never accept to sell their land. Maybon & Fredet, Histoire de la Concession française de Changhai, 1929, p. 234. 48 Maybon & Fredet, Histoire de la Concession française de Changhai, 1929, pp. 238. See picture “New North Gate (Porte Montauban)”, China collection, Box 35, Getty Research Institute. 49 Shanghai gonglu shi, 1989, p. 14. 73 Taylor’s interpretation of the Bund as a space per se fails to take into account the historical process of construction of the image/myth of the Bund. The terms did not create the space. The space came to be created out of necessity in different urban settings that Taylor does not discuss. The extent to which the term Bund came to acquire a specific meaning must have varied according to the cities, but above all it was a ‘myth-creation’ process that took place over several decades. It was also a process that took place within the Western world with a limited impact on local society. Taylor, Jeremy E., "The Bund: littoral space of empire in the treaty ports of East Asia", Social History, Vol. 27, No. 2, 2002. 81 Crow, Carl, The Travelers’ handbook for China, Shanghai, Kelly & Walsh, 1916, p. 86; 1933 (5th ed. ), pp. 145-146; The Travelers’ handbook for China, Shanghai, Dood, Mead & Co., 1921 (3rd ed. ), p. 106; 1925 (4th ed. ), pp. 139-140. 82 Crow, The Travelers’ handbook for China, 1921, p. 107. 86 There will be a sequel to this paper in the form of a visual narrative on “The Bund at Work”. 88 Wang, Jiaju, 王稼句 “Qianji” (Foreword) in Wang Tao 王韜, Man you sui lu 漫遊隨錄 (Idle travel notes), Shanghai, Zhu yi tang, 2004 , p. 6. The only known diary by Wang Tao does not include anything about his arrival in Shanghai. Wang, Tao 王 韜, Wang Tao riji 王韜日記 (Wang Tao diary), Beijing, Zhonghua shuju, 1987. 95 Ge, Yuanxu 葛元煦, Hu you za ji 滬游雜記 , Shanghai, Shanghai guji chubanshe 上海古籍出版社, 1989. 96 This discussion is based on the examination of the following guides: Shanghai zhinan 上海指南 (Guide to Shanghai : A Chinese Directory of the Port), Shanghai, Shangwu yinshuguan, 1909 (1st ed. ); 1919; 1920; 1923; 1925; 1926 ; 1930; Shanghai youlan zhinan 上海遊覽指南 (A Comprehensive Guide of Shanghai), Shanghai, Zhonghua tushu jicheng gongsi, 1923; Lin Zhen 林 震, Shanghai zhinan 上海指南 (Guide of Shanghai), Shanghai, Shangwu yinshuguan, 1930; Shanghai shenmi zhinan 上海神秘指南 (Secret Guide secret of Shanghai), Shanghai, Datong tushushe jianyin, s.d., 2 vol. ; Xu Wancheng 許晚成, Huang Jingwan 黄警頑, Shanghai zhinan 上海指南 (Guide of Shanghai), Shanghai, Guoguang shudian, s.d. ; Shen Bojing 沈伯經, Shanghai shi zhinan 上海市指南 (Guide of the Shanghai Municipality), Shanghai, Zhonghua shuju, 1933; Liu Peiqian 柳培潛 (ed. ), Da shanghai zhinan 大上海指南 (Guide of Greater Shanghai), Shanghai, Zhonghua shuju, 1936; Leng, Xingwu 冷省吾, Zuixin shanghai zhinan 最新上海指南 (New Guide of Shanghai), Shanghai, Shanghai wenhua yanjiushe, 1946; Wang Changnian (ed.) 王昌年 Da shanghai zhinan 大上海指南 (Guide of Greater Shanghai), Shanghai, Dongnan wenhua fuwushe, 1947. 98 Ji Longsheng, 鸡 笼生 Da shanghai 大上海 (Greater Shanghai), Taibei, Nanfang zazhishe, 1942, pp. 11-12 and 22-23. The guide presents only a few other major streets in the International Settlement (Nanking, Peking, Foochow, and Fukien roads). 99 See for instance Shen nü 神女 (Goddess), 1934; Malu tianshi 马路天使 (Street angel), 1937 or Sanmao liu lang ji 三毛流浪记 （San mao), 1949. 114 Dyce, Personal Reminiscences of Thirty Years, p. 32. 129 Murphey, Shanghai, p. 24. 136 Crinson, , Modern Architecture, p. 8. 137 Kuan and Rowe, Shanghai, p, 36. 138 Shanghai zhinan 1957 上海指南 (Guide to Shanghai, 1957), [Shanghai : s.n. ], 1957; Shanghai zhinan 上海指南 (Guide to Shanghai), Shanghai, Shanghai kexue jishu chubanshe, 1980. 148 On “Shanghai nostalgia”, see Zhang, Xudong, “Shanghai nostalgia: Postrevolutionary allegories in Wang Anyi’s literary production in the 1990s”, Positions: East Asian Cultures Critique, 8, 2, 2000, pp. 349-387. 149 The thrust of the whole paper is fairly accurate, with an emphasis on the Public Garden and its contested opening to the Chinese in 1928. The English version is quite similar, although the emphasis is more on the history and architecture. See (Chinese).